As you know, we’re big fans of hand-dyed yarn here at Stash and they certainly help with that “Wow” factor in our finished projects. Since every skein of hand-dyed yarn is a little bit different, it can be a bit challenging to use in larger projects. However, there are some tips and tricks you can use to make sure that you’re happy with your finished sweater! No woman wants a line directly across the chest area! Needless to say, this sweater ended up in the frog pond. There are a few things that went wrong here. The first being that my skeins didn’t match as closely as they should have. I also alternated the darkest two skeins instead of using all three at once. So, how can you avoid a sweater with a big, obvious line when you change skeins? 2. Alternate Skeins while you knit. There are a few different ways to do this that we’ll discuss in just a minute. 3. If you’re knitting a top-down sweater, Save some yarn from the top to use when you go back and knit the sleeves. TRUST ME on this one (I speak from experience). It doesn’t need to be a lot, but I’d suggest phasing the skein you’re using when you split for the sleeves out and putting it aside to be used later. When you get ready to knit the sleeves, pull this skein out and use 1/2 for the top of each sleeve. 4. If you have skeins in your stash that you’re using and one skein is a bit different than the rest, use the different skein for things like trim, button bands, hems, and neckbands. Alternating Skeins – to alternate skeins, work from two balls of yarn. Switch yarns every 2 rows (you can do 3 or 4 if you’re knitting in the round) by picking up the second strand of yarn from underneath the strand you’re working with. 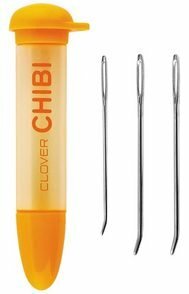 Make sure not to pull too tight when you pick up the new strand. 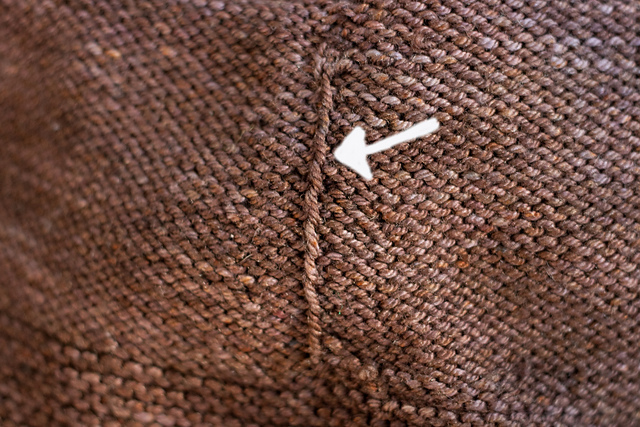 When you knit a cardigan with button bands (or just front bands/collar) that are knit on afterwards, such as the Calligraphy Cardigan, you can alternate right at the edge of your knitting every 2 rows. Easy peasy. 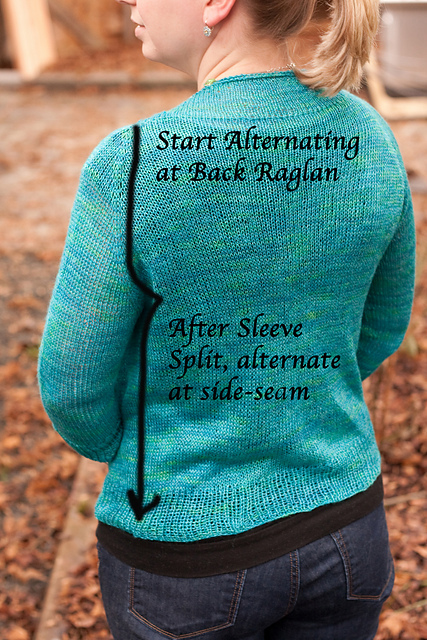 If you’re knitting a pullover from the top town, alternate starting at the back raglan and after you split for the sleeves, alternate at the side seam. If the sweater is knit from the bottom up, you would alternate at the side seam and then transition to the back raglan. This isn’t a pullover, but it has a decent shot of the back of the sweater so you can see where to alternate. For a cardigan that has you knit the front bands as you go, you can either alternate at the sideseam/back raglan as in the previous example or you can alternate where the body meets the front band. For Sleeves: alternate at the underarm, which will be the beginning of your round for each sleeve. I know alternating skeins sounds a bit tedious, but it’s really worth it when knitting with hand-dyed yarn. I’ve never been sorry that I’ve alternated skeins, but several times that I haven’t I’ve regretted it (see: frogged sweater at the top of the post!). Let us know if we can help you pick out well matching skeins at the shop or help you decide the best place to alternate skeins! Before we talk about the washed swatch, let’s talk about choosing the right size for your sweater. The first thing you’re going to want to do is take your measurements. I’m not going to pretend to be an expert on taking measurements, but there are some fantastic resources out there. Amy Herzog has a great post in the Fit to Flatter series about taking your measurements. There’s even a printable PDF to keep track of all the information you collect. If you have Little Red in the City by Ysolda Teague, you can take a look there for tips on taking measurements and she also provides a sheet to record all of your numbers. Now that you have your measurements, you’ll need to decide how much ease you’d like in your sweater. There are three types of ease: Positive, Negative, and Zero. Positive Ease means that your finished sweater measurements are larger than your body measurements. Negative Ease is when your sweater measurements are smaller than your body measurements and Zero Ease means that your sweater and your body measurements are the same. Take out a favorite store-bought sweater and take it’s measurements. This is usually a good place to start to figure out how much ease you’d like. I think one of the biggest mistakes that new sweater knitters make is choosing a size that is too large. I like to use my high bust measurement instead of full bust to choose my size. This will give you a good fit through top of the sweater, a bit of negative ease at full bust, and a good fit through the waist. Of course, not everyone is comfortable with a close fitting sweater and it really depends on your comfort level, the pattern, and the yarn. This sweater was knit with zero ease at the full bust. I knew I’d want to wear a t-shirt underneath it, and I didn’t want the cables to pull at the bust. 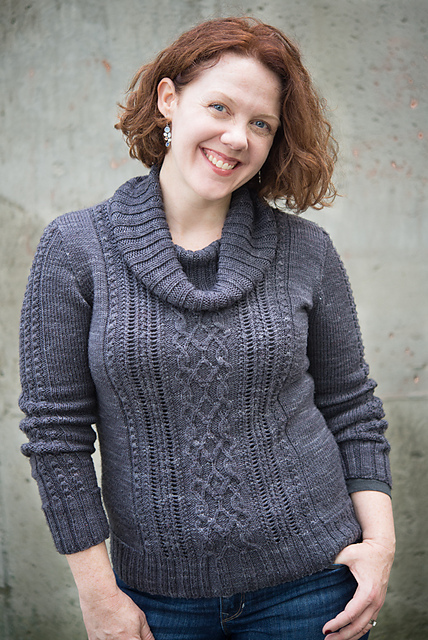 This sweater was knit with about 2 inches of negative ease at the full bust (so zero ease at high bust). 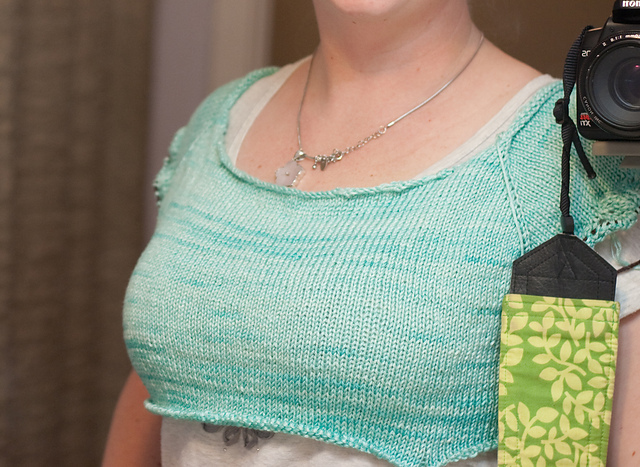 It was knit in a bulky yarn, and let’s be honest- none of us want to look more bulky, right?! After you’ve decided how much ease you’d like in your sweater, take a look at the pattern schematic. This will tell you the Finished Measurements of the sweater. Is there a size that is close to what you’d like for your finished sweater? Don’t get too caught up in inspecting every single measurement right off the bat. Focus on the finished chest measurement. You can make some really easy changes later on to adjust the sleeves, waist, and hem if you’d like them to be different than the pattern measurements. Now…measure the gauge on your washed swatch. Don’t worry too much about row gauge, focus on the stitches per inch. 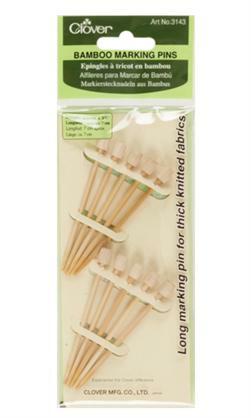 If your gauge matches the pattern gauge, great! You can cast-on for your sweater ! If not, you can do 1 of 2 things. You can either do another swatch with a different sized needle to try and get an exact match or you can do a little math and do the sweater with the needle size that you swatched with. Why is gauge so important? For smaller projects, being off by a stitch or two over 4 inches doesn’t always matter too much. However, when you’re talking about hundreds of stitches for the circumference of a sweater, those stitches add up fast. If the pattern gauge is 20 sts/4 inches and you are getting 18 sts/4 inches your sweater will be 22% larger if you don’t adjust for the difference. So, if you wanted your sweater to be 34″ it would actually end up being 41″! Take the time to adjust your gauge or do the math! You only want to go this route if you’re not too far off on your gauge. One or two stitches over 4 inches is fine…but if you are way off, go back and swatch again. Take a deep breath, this isn’t as complicated as it seems and I’d be more than happy to help you figure out the math over in our Ravelry Group (or at the shop!) if you aren’t sure about it. Let’s use the Featherweight Cardigan as an example. The gauge in the pattern is 24 sts/4 inches. Say your gauge is 22 sts/4 inches. 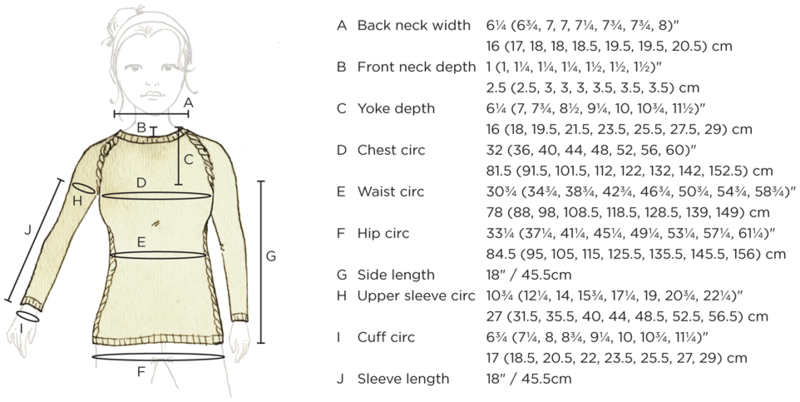 Less stitches per inch mean that your sweater will be larger than the schematic measurements. Take the PATTERN gauge divided by YOUR gauge and multiply that number by the finished measurement that is closest to the size you want. If you want to make the 38.75″ size… 24/22= 1.09 & 1.09 x 35.25 = 38.42, which is pretty darn close to 38.75″. 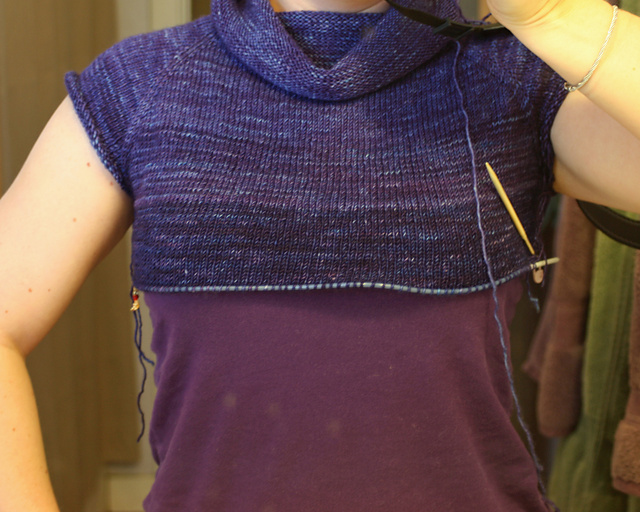 Now, if your gauge has MORE stitches/inch, it will mean a smaller finished sweater. If your gauge (for the same pattern) is 26 sts/4 inches, this is what the math would look like using the closest larger size. If you want to make the 38.75″ size….24/26= .92 & .92 x 42 = 38.64, again pretty close to your ideal size! I know it can be really tough to wrap your brain around all that math, so don’t feel like you have to “make it work”…keep swatching until you get the correct gauge! What to do if you are between sizes: If your ideal size is in-between the available sizes, don’t be discouraged! You can use the same math above to knit the sweater at a different gauge, or you can make some adjustments as you are knitting to achieve an in-between size. 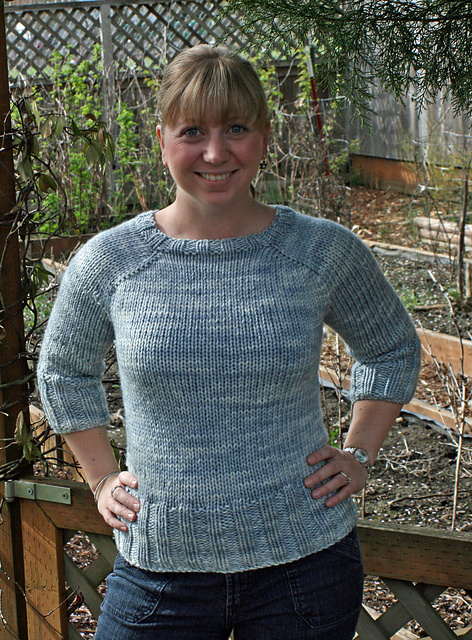 Most of Hannah Fettig’s patterns are raglan style top-down sweaters. It’s incredibly easy to just leave out a set or two of increases to achieve a smaller size or add a set or two of increases to achieve a larger size. We’ll talk more about this during the “Making adjustments on the fly” segment of the blog series! I know this post is very wordy and probably confusing after a first read through. Take it in small chunks or come ask questions in the ravelry group! 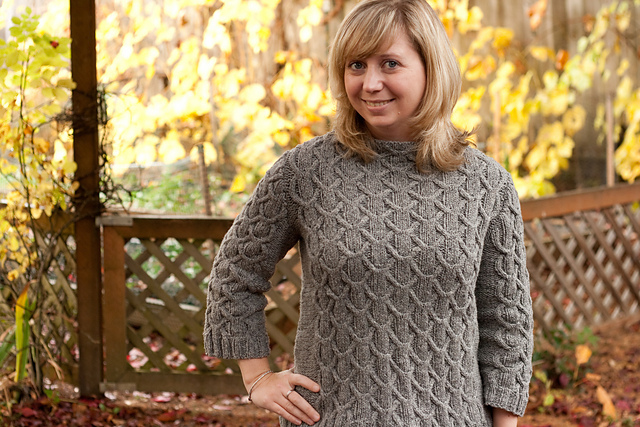 We really want you to have a successful sweater knitting experience!